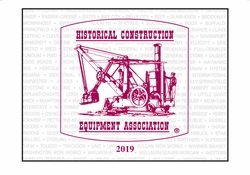 "NEW" The 2019 HCEA Photo Calendars are availble! Home > HCEA Calendars > "NEW" The 2019 HCEA Photo Calendars are availble! THE 2019 HCEA CALENDARS ARE AVAILABLE! Wabco coal hauler and Marion shovel at the Navajo Mine south of Farmington, New Mexico; Galion Pony pull grader; Lorain 77 shovel and Euclid bottom dump; backfilling with an Austin-Western Pacer series motor grader; LeTourneau Model A1 Tournapulls with HU double-bucket, 30 heaped yard capacity Carryalls at Hansen Dam; Erie Type B traction crane; Marion 5320 electric stripping shovel; Marion 43-M truck crane picking a blasting mat; Bechtel Corporation’s first steam shovel, a Marion Model 20, building the Western Pacific Railroad in 1909; form-riding concrete paving in the 1940s-1950s; Cat D4 with Trackson T4 loader and Hyster D4 winch and Federal dump truck; Thew traction wheel shovel excavating trench with an elongated boom and dipper. These wonderful pictures are never out of date! All proceeds go to support the HCEA.